You can help prevent drowning and near-drowning accidents with your financial support of the Barrett Smades Forrest Drowning Prevention Fund at Valley Children's Hospital. In 1987 while under the care of a babysitter, Barrett was permanently brain injured in a near-drowning in a backyard pool. His caregiver drowned saving him. 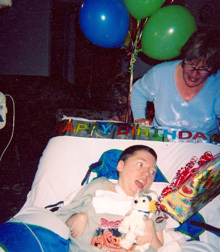 Barrett is now in his 20s and resides in an assisted-living care facility. His mom, Debbie Smades Henes, has traveled across the nation telling her story to educate others on how to prevent similar tragedies. The family set up the Barrett Smades Forrest Drowning Prevention Fund to help Valley Children's Hospital share the message of water safety through educational events and activities. Make your secure online donation now or call (559) 353-7100 with your gift. With your support of the Kohl’s Water Safety Program, we can continue to share the lifesaving message that teaches both children and adults how to keep kids safe from water-related injuries. For more information about the Kohl's Water Safety Program, call Mary Jo Quintero, Prehospital Liaison Nurse in the Emergency Department at Valley Children's Hospital and Water Watchers Coordinator, at (559) 353-8661 or email at: mquintero@valleychildrens.org.